Attractions like Elephant Safari Park and Pande's Farm make great kid-friendly stops. Venture out of the city with trips to Kintamani (Kintamani Plateau, Mt Batur, & more). The adventure continues: contemplate in the serene atmosphere at Tirta Empul Temple, explore by horseback at Ubud Horse Stables, head outdoors with Tampaksiring Journey, and delve into the distant past at Gunung Kawi Sebatu Temple. To find other places to visit, maps, more things to do, and other tourist information, read our Tegalalang trip tool . Reykjavik, Iceland to Tegalalang is an approximately 27-hour flight. Due to the time zone difference, you'll lose 8 hours traveling from Reykjavik to Tegalalang. Prepare for much hotter weather when traveling from Reykjavik in February: high temperatures in Tegalalang hover around 36°C and lows are around 28°C. Finish up your sightseeing early on the 8th (Sat) so you can travel to Amed. Start off your visit on the 9th (Sun): tour the pleasant surroundings at Amed Beach and then see some colorful creatures with a scuba or snorkeling tour. On the next day, make a trip to Lempuyang Temple, take in nature's colorful creations at Tirta Gangga, then contemplate the long history of USS Liberty Shipwreck, and finally kick back and relax at Jemeluk Beach. To find more things to do, reviews, and tourist information, go to the Amed travel route planner. You can drive from Tegalalang to Amed in 2.5 hours. In February in Amed, expect temperatures between 36°C during the day and 27°C at night. Wrap up your sightseeing on the 10th (Mon) to allow time to drive to Denpasar. 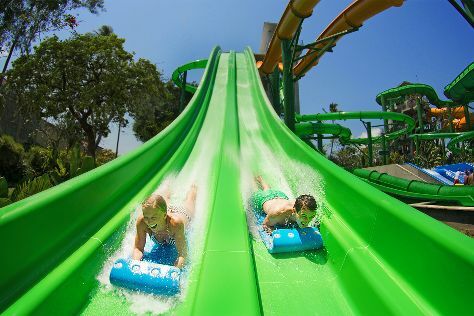 Family-friendly places like Waterbom Bali and Kuta Beach - Bali will thrill your kids. Venture out of the city with trips to Ubud (Spas & Wellness, Tegalalang Rice Terrace, & more), Pecatu (Uluwatu Temple & Padang Padang Beach) and Nusa Dua Beach (in Nusa Dua). Spend the 16th (Sun) among aquatic life with a scuba or snorkeling tour. Pack the 20th (Thu) with family-friendly diversions at Bali Safari & Marine Park. There's much more to do: kick back and relax at Pantai Sanur, stroll through Seminyak Beach, test your team's savvy at popular escape rooms, and get outside with Jimbaran Bay. For reviews, more things to do, maps, and more tourist information, you can read our Denpasar online day trip planner . Getting from Amed to Denpasar by car takes about 1.5 hours. Other options: do a combination of bus and taxi. February in Denpasar sees daily highs of 36°C and lows of 28°C at night. Cap off your sightseeing on the 23rd (Sun) early enough to travel back home.